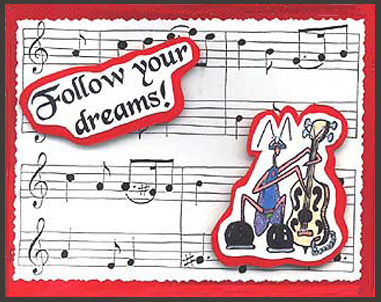 “Musical Notes Background #1”, “Manfred Mantis on Bass, Lg.” and “Follow your dreams!” are stamped on bristol plate card stock with Memories ink. Manfred is colored with pencils and gel pens. The words and Manfred Mantis are raised with foam dots. The wings are glittered with Stickles Platinum glitter glue over colored pencil. Card by Margaret Wiggin. 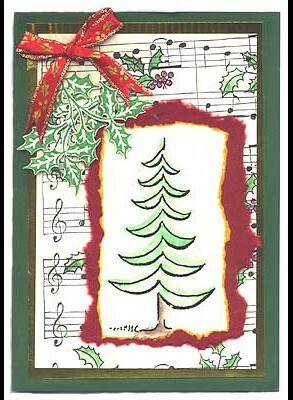 The background paper was created by stamping “Musical Notes Background #1” and “Line Art Holly, Sm.” several times with a black memories pad on tan parchment card stock, coloring the holly berries and leaves with a watercolor pencil and brushing with a wet brush. Two sets of “Holly Sprig, Med.” were stamped with green ink, cut out and attached in the upper left corner. “Modern Christmas Tree” was embossed in black and colored with watercolors. The edges were torn and colored with a gold marker. This piece was layered on a torn piece of cranberry colored handmade paper and both were layered on the background. The background was layered on gold green card stock. A red bow with gold holly leaves and berries was added to the upper left corner for an accent. Card by Anaka Kagen.